Athletes and fitness trainers will soon get a cheap and easy way to follow the body fat burning. 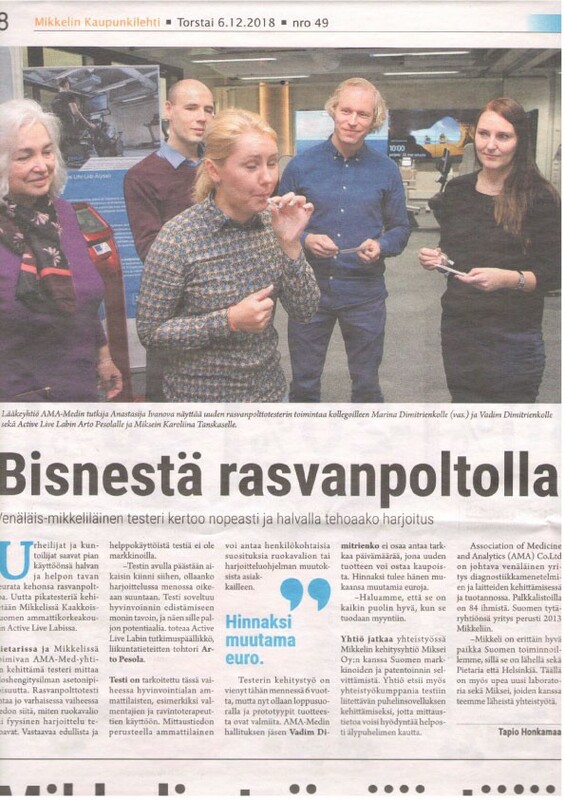 The new quick test is being developed in cooperation with the Active Life Lab, South-Eastern Finland University of Applied Sciences (XAMK) in Mikkeli. The test developed by the AMA-Med Group in St. Petersburg and Mikkeli measures the traces of acetone content in exhaled air. The fat burning test provides information on how diet or physical exercise work at an early stage. There is no similar low cost and easy test on the market. -- With the help of the test, it can be made clear early in the day if the training is going in the right direction. The test is suitable for promoting well-being in many ways, and has a lot of potential, says Arto Pesola, PhD in sport and health sciences at XAMK, Active Life Lab. The test is currently intended to be used by professionals in the welfare sector, such as coaches and nutritionists. Based on the measurement data, the professional can give individual recommendations on changes of the diet or training program to their clients. The test is being developed for six years, but is now on the final stages and is ready for the prototypes. Vadim Dmitrienko, a member of the AMA-Med board, is unable to give an exact day on which a new product can be purchased from stores. According to him, the price should just be few euros. -- We want it to be good in every aspect when it is put on sale. The Group continues to work with Mikkeli Development Miksei Ltd Oy to investigate the Finnish market and patenting. The Group is also looking for a collaborative partner to develop an application for the test, so that measurement data can be easily accessed through a smartphone. Association of Medicine and Analytics (AMA) Co.Ltd is a leading Russian company in the development and production of diagnostic methods and equipment. There are 84 people on the payroll. The Finnish subsidiary of the company was founded in 2013 in Mikkeli. -- Mikkeli is a very good place for our operations in Finland. It boasts new laboratories and is open for cooperation. Based on the original publication of Tapio Honkamaa in Mikkelin Kaupunkilehti #49.